We provide custom technology services along the author-to-reader value chain, which includes content authoring and development, submission and acceptance, content management, editorial, production, delivery and hosting, and customer management. We help publishers effectively manage their application portfolios through customizable solutions. Our customers vouch for our commitment and our ability to deliver what we promise, enhancing their relationships with us every year. 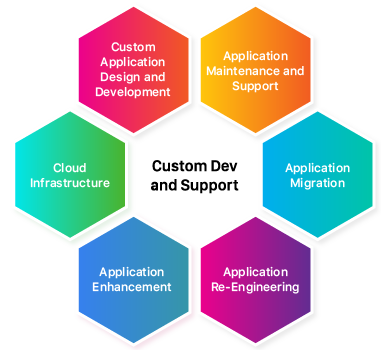 A Custom Software Development project needs to deliver an application that provides tangible business value, advances your market position, and propels you ahead of your competition, all within your schedule and budget. Over the years, we have developed a predictable methodology for successful delivery. We understand that each project has unique requirements, and we craft a custom approach after thoroughly studying and analyzing these needs. All our custom development projects are powered by the Agile Project Management methodology. Agile principles are all about being collaborative, flexible, and adaptive. We have built this on the premise that technology changes regularly and that means custom software teams no longer have years to work on projects. Considering this, competitor offerings or customer expectations also changes with time, making certain risks irrelevant. Agile minimizes this risk by helping teams collaborate together more by adapting to what the team needs to be successful. We do this by encouraging teams to regularly show off their work and gather feedback so that they can adapt to change quickly.